Music – Faith Lutheran Church has a rich musical heritage. 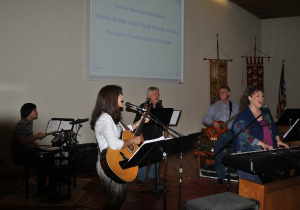 We offer two styles of worship every Sunday morning We invite you to join us in celebrating our Christian faith through music and worship by becoming involved in the Music Ministry of Faith Lutheran Church. We have a choir, Praise Team and Bell Choir that meet during the week in preparation for the leadership and enhancement of our worship services. There is room for everyone, please join us!! Our Handbell Choir enhances the worship services by providing inspirational music rotating among the traditional services from September through May and is open to anyone. Reading music and counting rhythms is not a requirement for this choir, but it does help. The Bell Choir practices on Thursday from 6:00 p.m-7:00 p.m. and is directed by Dr. David McCalla, Director of Traditional Music. Handel’s Messiah – Each year Faith Lutheran Church presents Part I of Handel’s Messiah. The performance is free and is a gift to the community, everyone is invited to this special event. The choir and musicians come from churches, schools and other organizations from Fort Pierce to Homestead and is directed by our own Dr. David McCalla. The concert is usually on the second Saturday of December. Check our website around that time for more information. This high-energetic and fun loving ensemble prepares and leads all of the music each week for the 11 a.m. Contemporary Worship in the sanctuary. Please Contact Janet Cunningham to become a part of our Praise Team! Altar Guild – It is truly an honor and privilege to serve our Lord and fellow members by preparing His House for worship and preparing His Supper for all to partake. 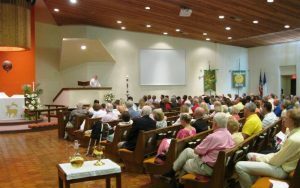 This is what the Altar Guild of Faith Lutheran Church does! Audio/Visual Ministry – The Audio/Visual Ministry is dedicated to running the sound, lights and video elements for all church and school productions. Worship has elevated to a new level. In these modern times, worship often incorporates technology. This is where the Audio/Visual Ministry shines! The mission of our ministry is to make a difference through the intuitive design of worship/production elements and by carrying them out effectively, enriching the experience of worshippers and glorifying His name! WE NEED VOLUNTEERS!! Please contact the church office at 561-848-4737 if interested. Usher Teams – If you are interested in serving as an usher at Faith Lutheran Church please contact the church office at 561-848-4737. Please be sure to let them know which service that you would like to serve. We usually have 2-4 ushers per service and duties vary from greeting parishioners,handing out bulletins , collecting offerings, directing parishioners towards communion and tidying up after each service.